As far as I can tell, Codemasters exist in a separate universe to the rest of us. It's almost exactly the same as our version of reality, except for one key difference: YouTube. First it was Dirt 3, which constantly recommended I upload uneventful wins to the video sharing site, seemingly untroubled by the fact that no-one would be remotely interested in displays of moderate competence. 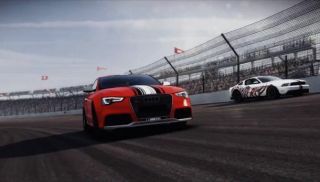 Now it's this Grid 2 trailer, previewing the game's "redefined" multiplayer and social features, including YouTube intergration. I'm just not sure "Can ANYONE beat this guy?!?!" is a sentence that any commenter would type. Optimistic integration aside, Grid 2's multiplayer plans do sound varied. Players will be assigned a rival based on their skill level, or can challenge people to compete in races. They'll also collect NPC followers - stealing them from opponents that they beat. Add in weekly challenges, and you've got a robust system for keeping online racers amused. Grid 2 is due out May 31st.